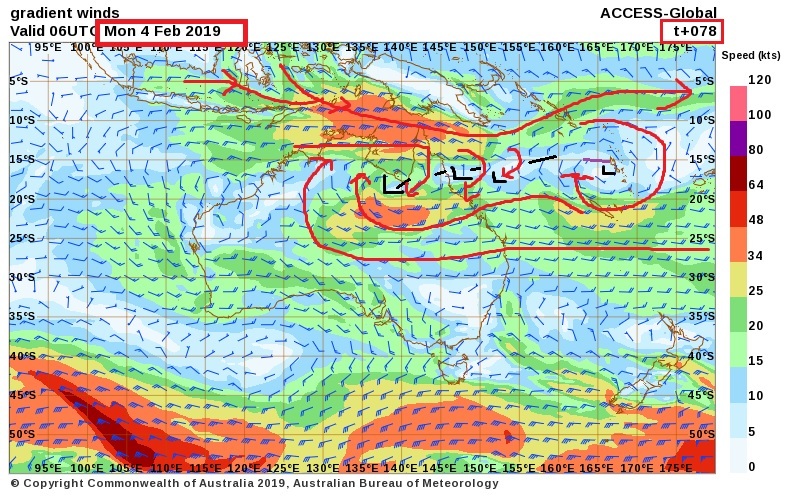 There is an interesting steering pattern in the Coral Sea at the moment, there is a big upper high over the Tasman Sea and an upper low to the north of the upper high. Embedded lows across the trough line and strong easterly winds pushing onshore. Embedded troughs will enhance precipitation and strong easterlies may enhance the king tide. the southern flank is often the strongest and here on this forecast Townsville is in the firing line at 20s. Hmmm... Looking at Windy.com it looks like the models have this low in NW Queensland tracks east into the CS and then spins up? So Crikey does that mean that there is no relief in sight for the folks in Townsville? I'm been watching some things in the Pacific Ocean may come hear the QLD coral sea over the next few days. I am going with an high chance maybe. Townsville getting all the rain it's missed for years, at once. The extended modeling still leaves the door open for more speculation regarding this low. It's starting to look increasingly likely it will cross the cape and re-emerge back into the Coral Sea but conditions look rubbish for re-intensification at first. There are signs though of conditions becoming more conducive a few days later once shear settles down but it could all be for nothing if the low moves east too quickly. Longer-term modelling and ensembles are not in good agreement at all with the timing of recurve later next week. The slower, the better (from a weather enthusiast's point of view, not for those already suffering from flooding) or else it's off to the E then SE. Normally, I'm the negative nancy but I still think it's too early to call what happens with this low in the longer-term. Seems that AccessG is finally throwing that low into that ESE rubbish bin & nothing for SEQ. crikey to 'madelf' . the 10 day forecast . 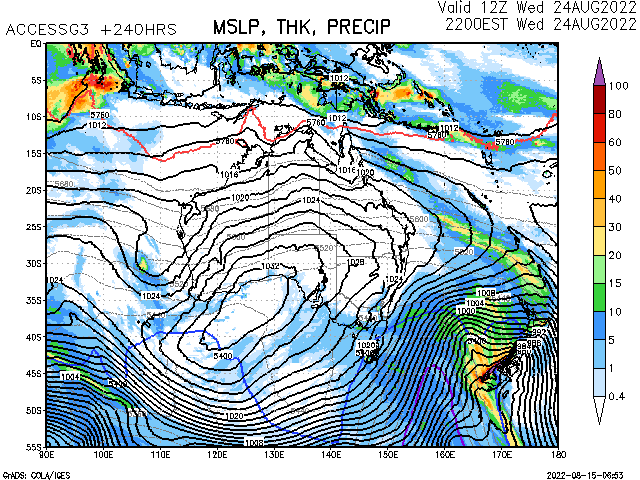 a weak ridge lies between SE/QLD and the transitioning low/TS . The outer bands not far from the coast. I reckon we will get something. On the map below the low is still being fed from the monsonnal flow to its NE . 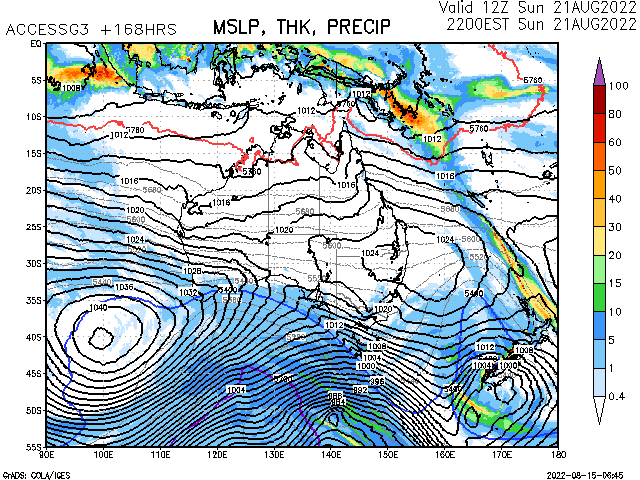 I wonder if this low will make TC status in the coral sea off the QLD coast? What say the other models? Who knows Crikey, it might do a pirouette & come in later on? Anyway it is beyond day 5 in the model run so nothing to take seriously for now. Problem has been there's NO steering. All over. Will become yet another victim of the always so hostile atmospheric conditions of the Coral Sea. This one is GFS, but I thought it was a bit wild. Yep. The end of the model runs look encouraging for anything tropical in the Coral Sea to be steered from east to west under a deep layer ridge (whereas the ridge running through Coral Sea currently only really exists in the lower/mid levels while the upper levels remain heavily troughy which is supportive of SE movement of stronger systems). But as you say, what's the bet a shortwave pops up out of nowhere and disrupts the predicted 'proper' ridge onto the coast? Sigh. 6 registered (snowbooby, Simmo FNQ, Aussea, FujiWha, Mr Buzle, 1 invisible), 48 Guests and 2 Spiders online.